What is the service and who is it for? If you are a religious congregation that operates or maintains missions and organisations overseas, we can provide technical support to you in terms of strategic review, on-the-ground assessment of overseas work, or methods to implement and monitor models of good practice in early years, primary and after-school education as well as adult education and training for employment. If you are an Irish Development Organisation, we can travel to your overseas partner organisations, to assist in their work related to gender empowerment and equality, community development and aligning their goals and work with the objectives of the MDG’s. We can trouble-shoot, assess and share good practice with your partners. If you are an Irish Local Authority supporting the infrastructural development of cities or rural settings within a developing country, we can work with you to ensure that the new or improved infrastructure can be used to deliver quality services in education and health. If you are an Irish NGO who has a successful model to share with an overseas group or organisation that fits with your ethos and vision. We can work with you to establish the partnership, to source finance and to set in place good practice policies and working methods. In 2009 we worked with a community development organisation in Aires, situated on the outskirts of one of the most deprived barrios of the city. The purpose of the trip was to enable the establishment of a partnership between this Argentine group and an Irish community-based organisation. This work has resulted in successful grant support through Irish Aid (and Misean Cara), to enable the sharing of an Irish model of a women’s and children’s education programme with the group in Buenos Aires. 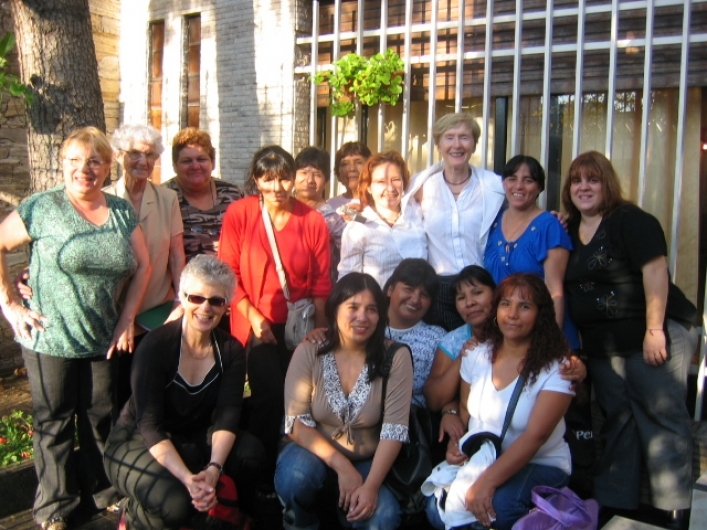 In 2010, 15 women and 30 children in an Argentine barrio will benefit from Irish expertise and guidance. It is anticipated that the implementation of this programme will enable the organisation to take its next steps in consolidating sustainability for their longer-term vision. Katherine and Ann Louise have travelled extensively throughout developing countries within Africa, South America, India and more recently Cuba. During their travels to Santiago, Chile; Addis Ababa, other towns and the bush in Ethiopia; townships in Capetown and Johannesburg, South Africa; barrios in Buenos Aires, Argentina; Calcutta and rural villages of India, and the length and breadth of Cuba, they have met with community development organisations working to reduce poverty through innovative education and health programmes. Many of these organisations and community groups place their work within the context of the United Nations Millennium Development Goals to reduce extreme poverty. In each setting, Ann Louise and Katherine have engaged in substantive dialogue with key actors, sharing Irish best practice and learning from methodologies employed by leaders overseas. Katherine’s background as a Commissioner with the Irish Human Rights Commission has enabled the dialogue to focus on human rights-based approaches to community education and community health, and Ann Louise’s experience in training Irish primary school teachers, with a special focus on disadvantaged contexts, has supported the exploration of links between formal and informal educational settings.